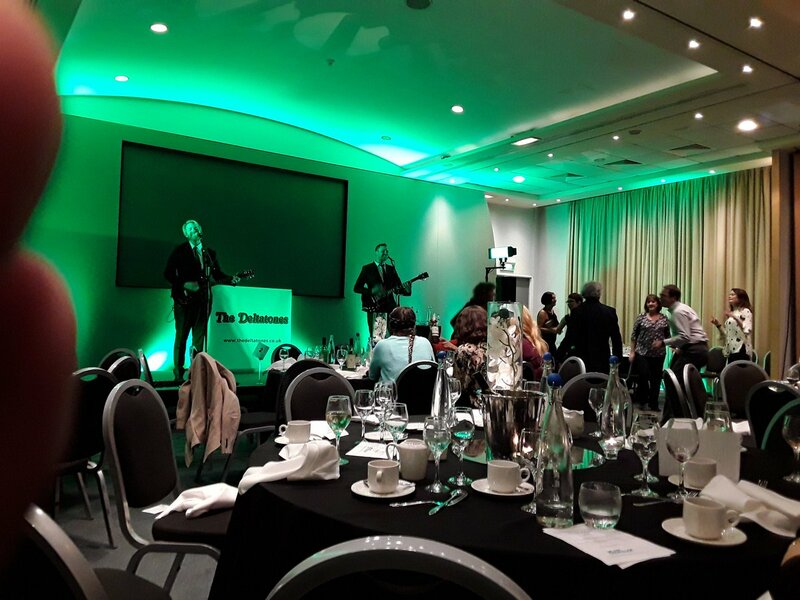 Tonight we were booked by Macmillan Charity to play at their CancerVoices Conference. Cancer Voices are people from across the UK who have all been affected by cancer in some way. They share their experiences to help shape cancer services and improve cancer care. There’s no such thing as a typical Cancer Voice, they come from all age groups and walks of life but they are all vital to shaping the future of cancer services. We were booked to play live music for the delegates after their meal. We were informed before the show by the organisers that due to the ongoing treatment that some of the delegates that they may be a bit tired and not as lively as some of our other audiences. They were certainly proven wrong. As soon as we kicked in to our first song; You Can Call Me Al by Paul Simon, the audience were up on their feet, dancing and singing along. They even moved tables out of the way to form an impromptu dancefloor. We had a great time performing at the conference and met some amazing people. It was a great night for a great cause and we hope to do more work with Macmillan in the future.